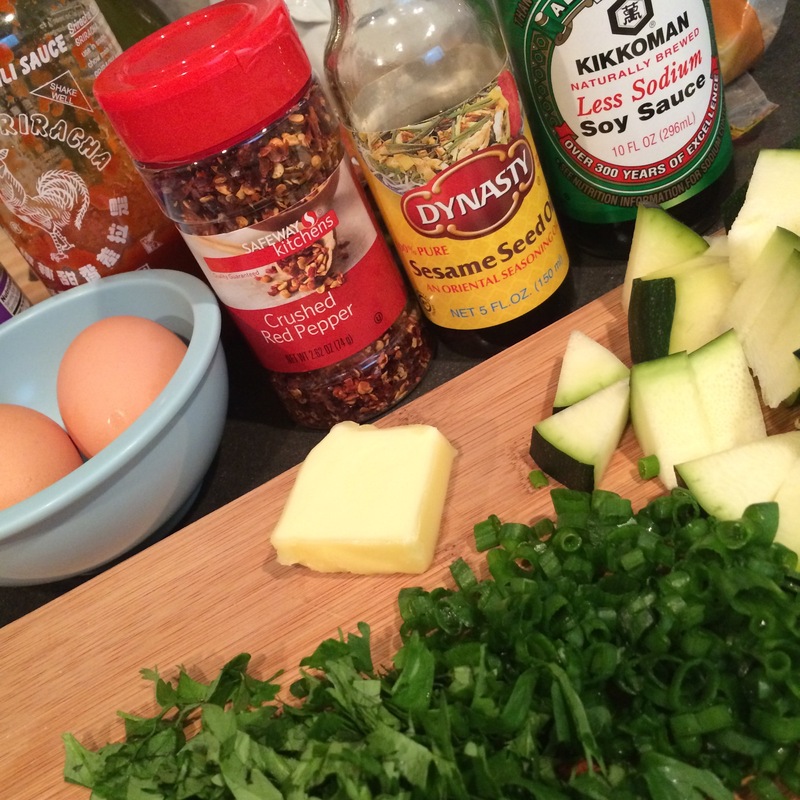 I decided to go with an Asian feel for tacos this week. 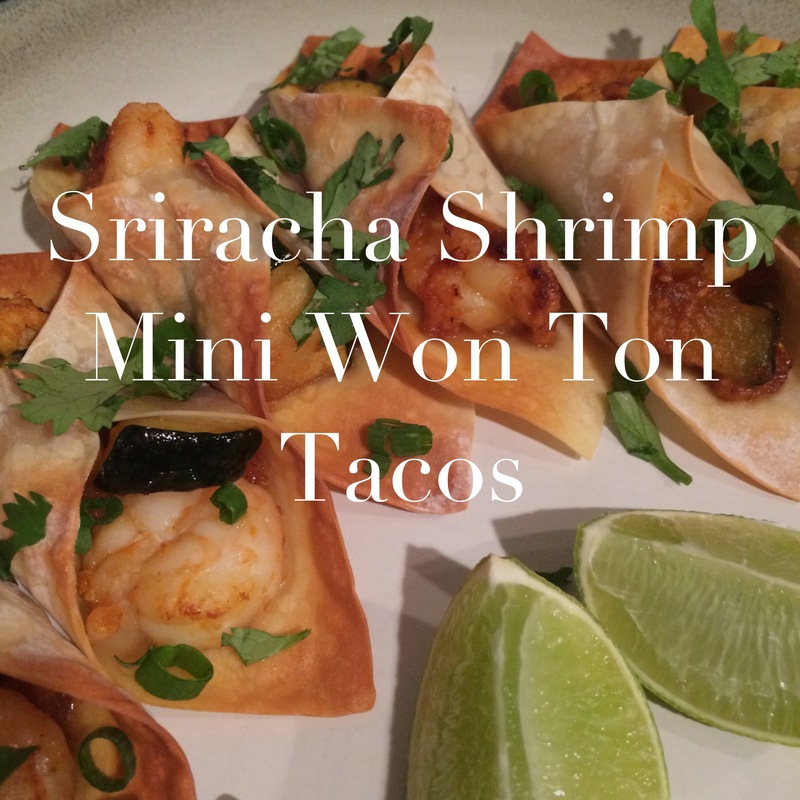 I had pinned a recipe for Sriracha Shrimp Lo Mein from Baker by Nature, and while discussing the weekly meal plan, my husband came up with the idea of making them into tacos. 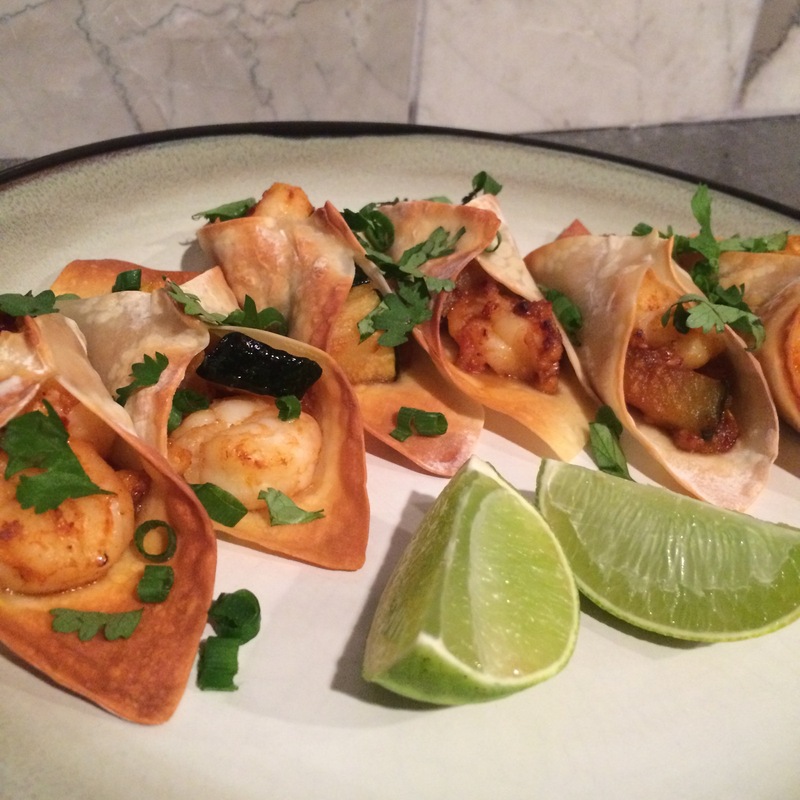 I chose to up the ante by making them into the cutest mini won ton tacos you have ever seen. Okay, that may be an exaggeration, but they are really cute, really spicy and quite delicious. The recipe is simple and quick, and could work for a meal, or as an appetizer. Wash, chop and prep your veggies. Get all of your ingredients out and preheat your oven to 400. Spray some cooking oil on a baking sheet and set aside. You will also need 3 mixing bowls and 2 small plates. Let’s make the sauce. 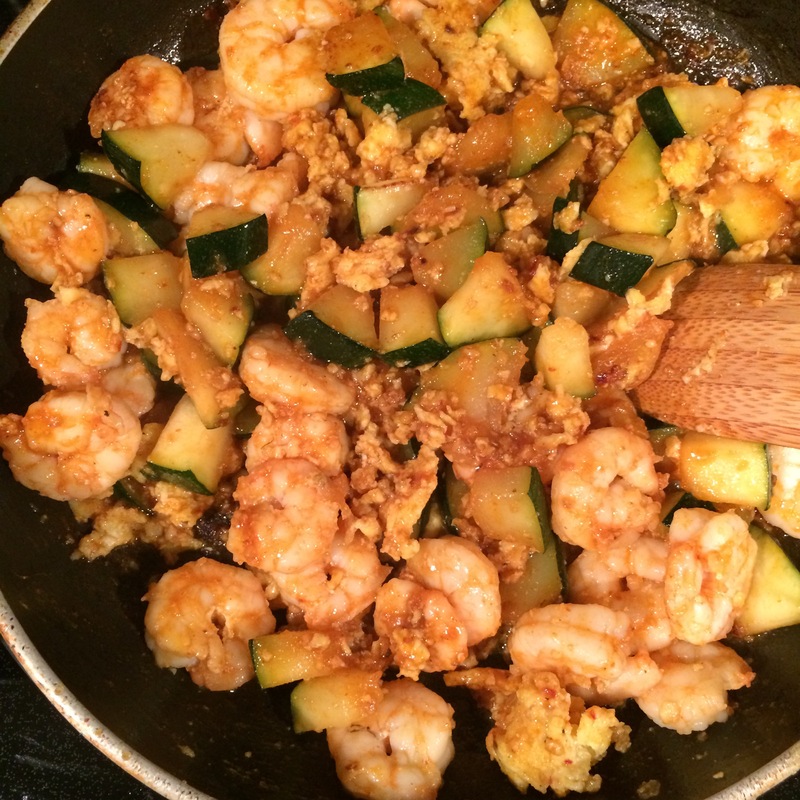 Simply whisk together the sauce ingredients; Sriracha, soy sauce, sesame seed oil and brown sugar. Next, put your stove to low-medium heat and melt the butter in it. As it melts, stir in the red pepper flakes. Beat the eggs, raise the heat to medium and add them to pan. Once the eggs are done, move them to a plate and set aside. 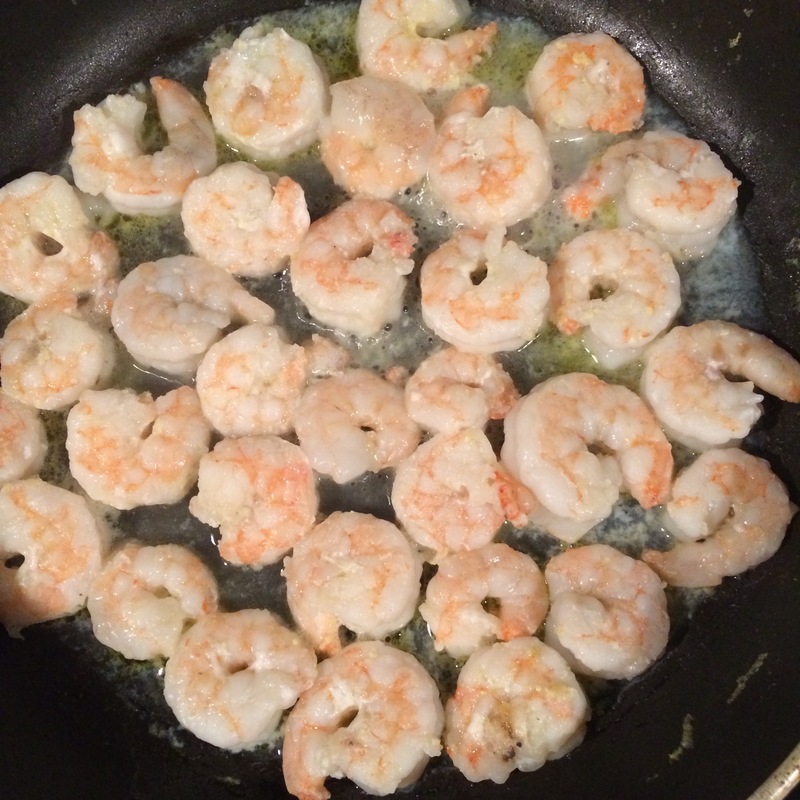 Add a 1-1/2 tablespoons of olive oil to your pan and add the shrimp. It should only take 2-3 minutes on each side to cook the shrimp. You’re looking for them to be firm and pink. Once they’re done, set them aside on a plate. Turn up the heat to high, and add the olive oil and zucchini. Cook for a good 5 minutes and then add the garlic and cook for another 5 minutes. Now, it’s time to combine everything. 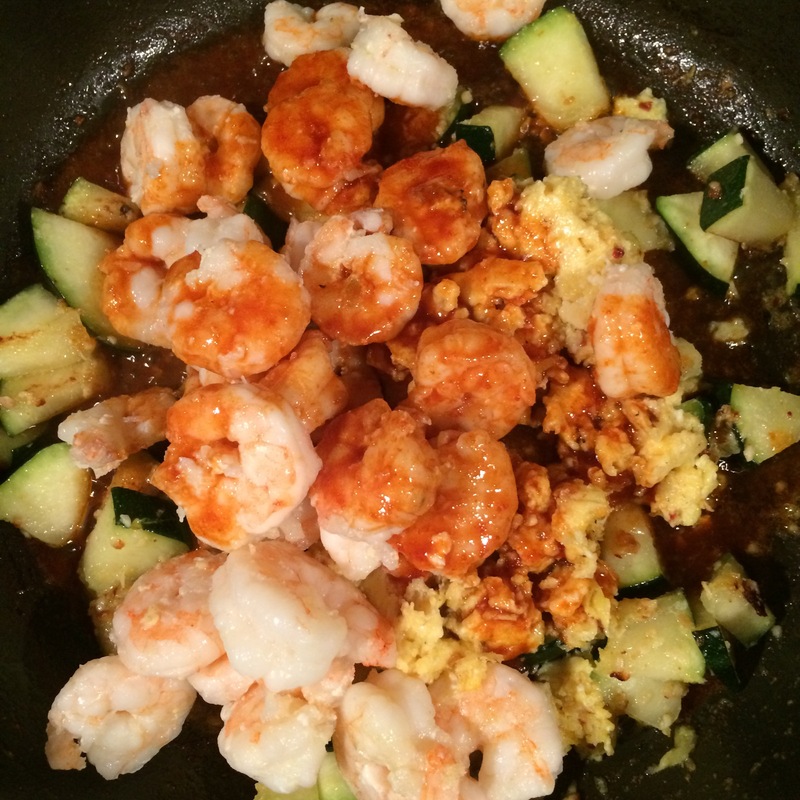 Turn the heat down to medium and dump in the eggs, shrimp, and sauce. Toss it all together and mix well. Move the pan off the burner and grab your baking sheet. 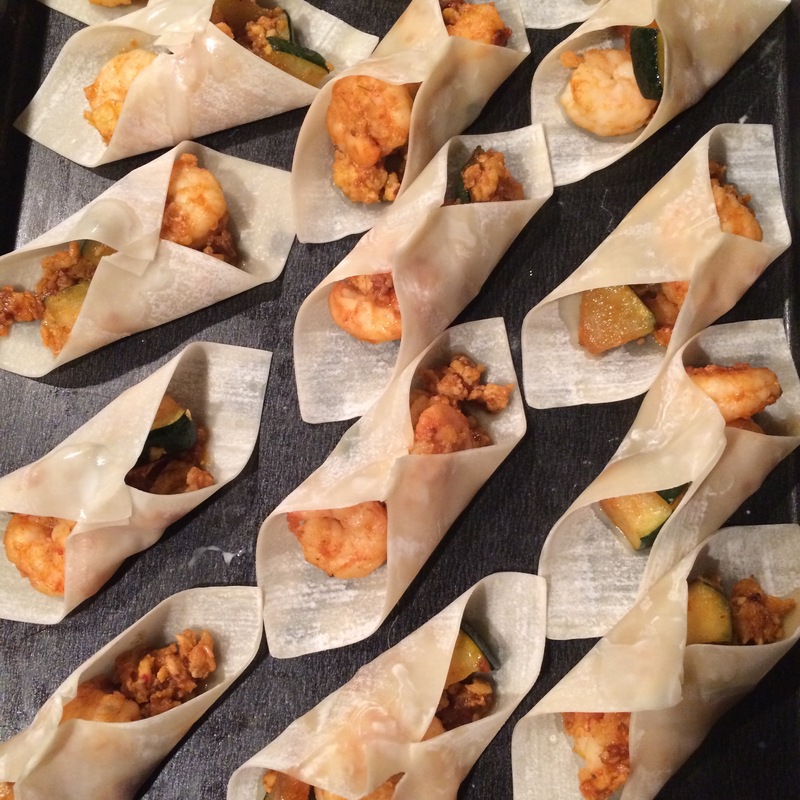 Place won ton wrappers on the baking sheet, as many as you can fit. Add a little water to the last mixing bowl. Now, it’s time to add the filling. 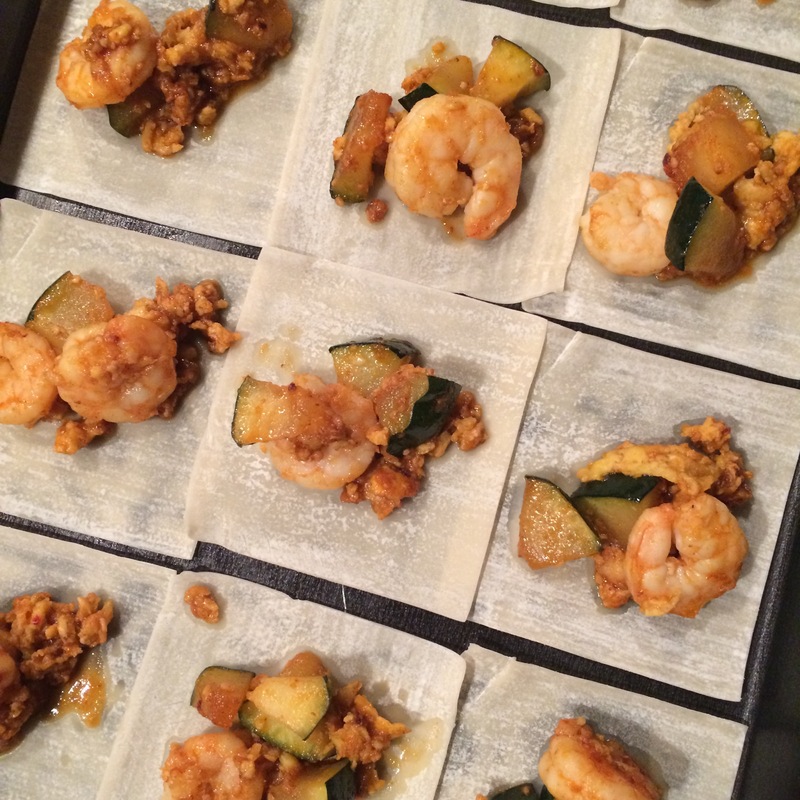 Put a generous tablespoon of filling on each won ton wrapper. Be sure to put a little of everything in each one. Once there’s filling in each one, it’s time to close them up. Dip your fingers in the water and bring the two corners together. The water is like glue to keep the taco shape. Do this to all of them and pop them in the oven for about 10 minutes. Pull them out of the oven, let them cool for a couple minutes and then plate them with lime wedges and a generous sprinkle of green onion and cilantro. So yummy! I hope you will give this recipe a shot. The recipe made about 20 tacos and I ended up with about 1-1/2 cups of Sriracha shrimp and zucchini, so I put it over rice for lunch today. Happy Taco Tuesday to you! I’m sad to report that this Taco Tuesday was not among the best. I was winging it and managed to save it in the end, but it wasn’t easy. I didn’t keep very good track of the water needed, since I just watched the beans to ensure they were cooked all the way. Below is a rough estimate of you’ll need for the lentils, but feel free to customize it however you want. I decided to use Cotija cheese and corn tortillas. For the lentils, begin by sauteing the garlic for a few minutes, and then add your onion and saute for another few minutes. 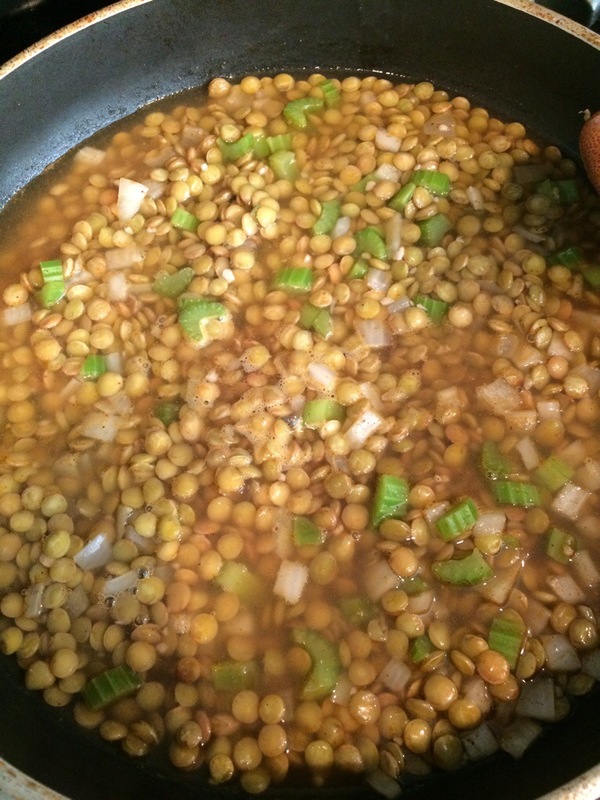 Add your lentils, and add 2 cups of water to start. You will gradually add more as they cook. Add your spices. You could use half a packet of taco seasoning instead if you wish. Put the lid on and let it cook over medium heat for about 30 minutes. While it’s cooking, you can chop your celery and zucchini. After 30 minutes, take a look. You will most likely need to add more water. I suggest adding water in 1/2 cup increments. Add your celery now. Put the lid on and let it cook for another 20 minutes. Take a look and see how they’re doing, most likely they are almost done. 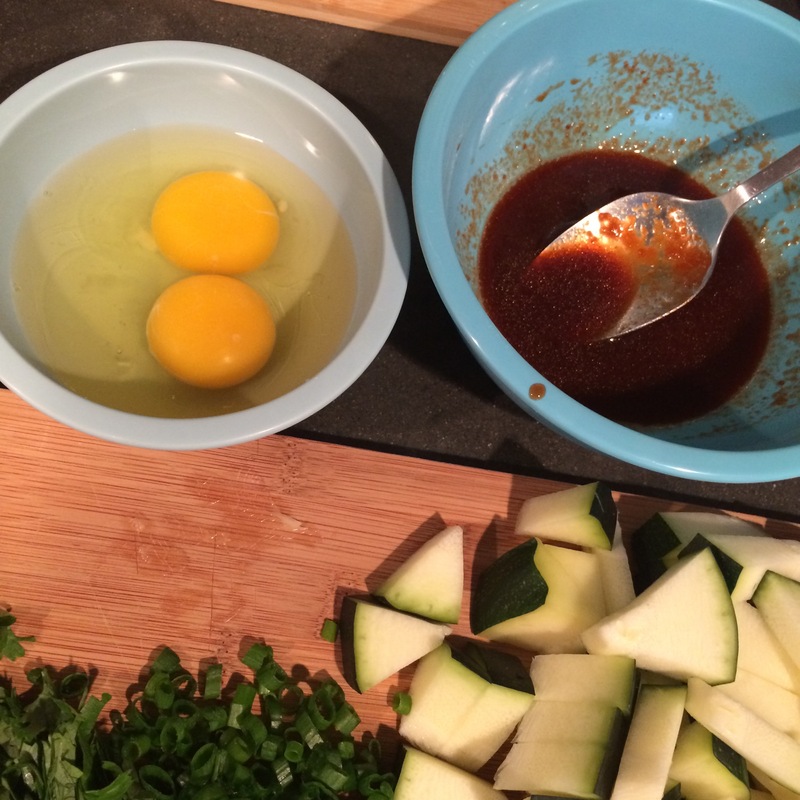 Add the zucchini and really stir it in there, so it can get all that flavor. 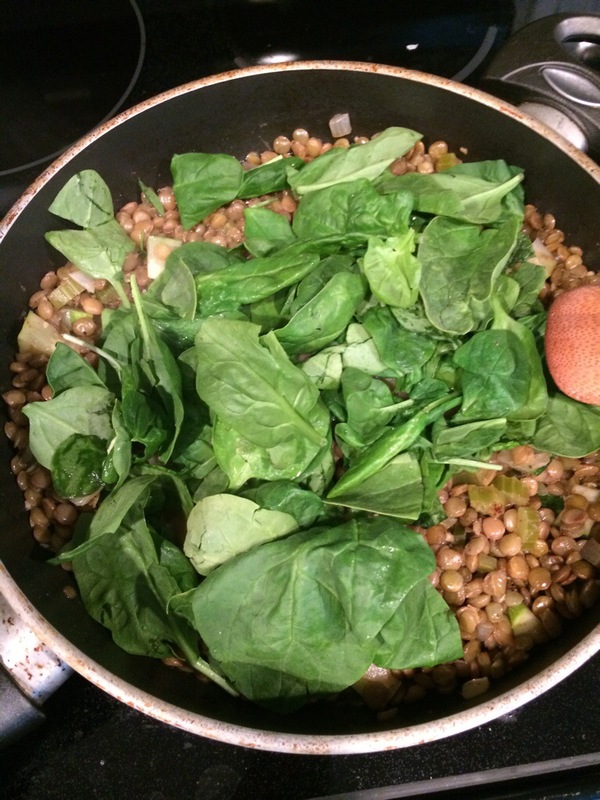 Next, add a big handful of spinach, turn the heat down to low, and stir that in very well. You’re done with the lentils! This is where my plan went awry. I normally heat corn tortillas in the microwave with a damp paper towel, so that’s what I did. Then I added the filling and the cotija crumbles, aaaaaaand it was boring. It tasted good, but it was missing something. Hot sauce?! Yes, a little hot sauce helped but something was still not quite right. 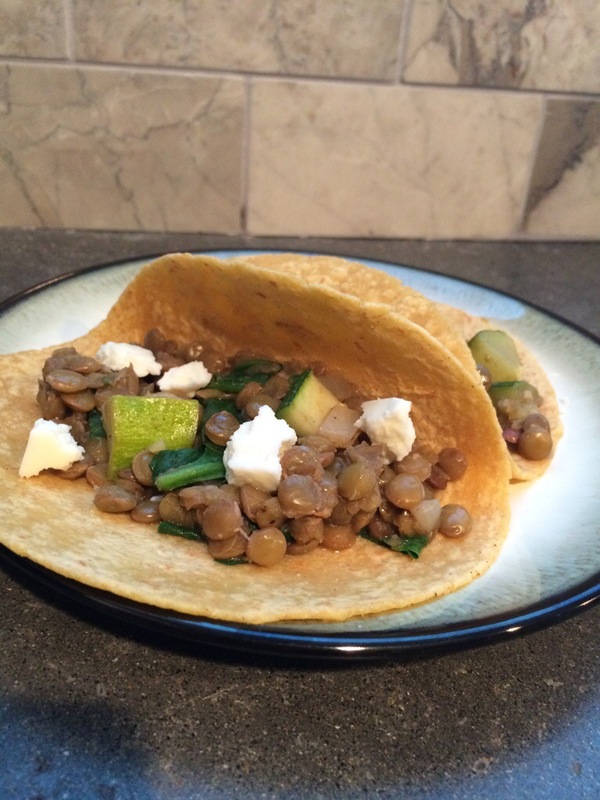 My husband got home later in the evening, so I offered him a plate of boring tacos. I decided that this was an opportunity to try again. I heated the tortillas on the stove top this time, and I melted the cotjia right on the tortilla. Then, I added the lentils, and lastly, a little hot sauce. The verdict? And I quote, “that melted cheese is money, babe.” I think by crisping the tortillas and melting the cheese, I got the texture I was missing before. 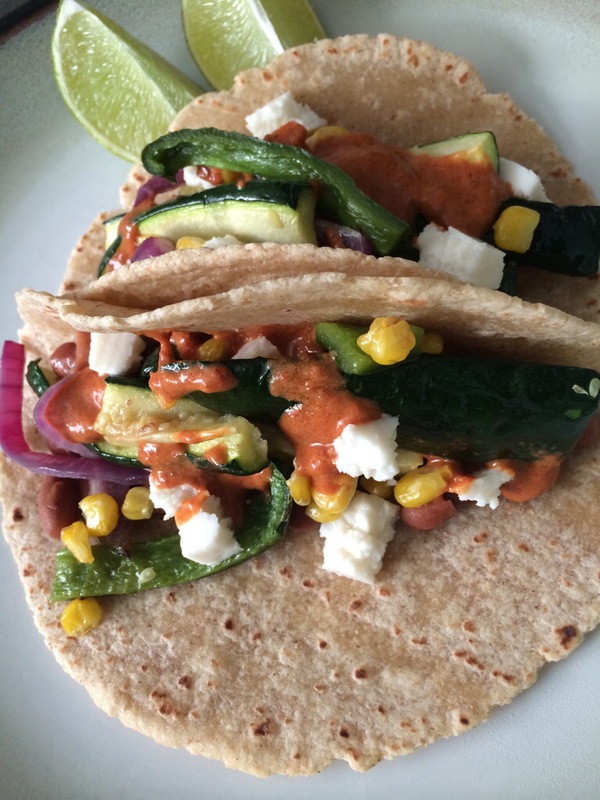 There you have it, what to do and what not to do in this week’s Taco Tuesday…on Wednesday. I know what you’re thinking? 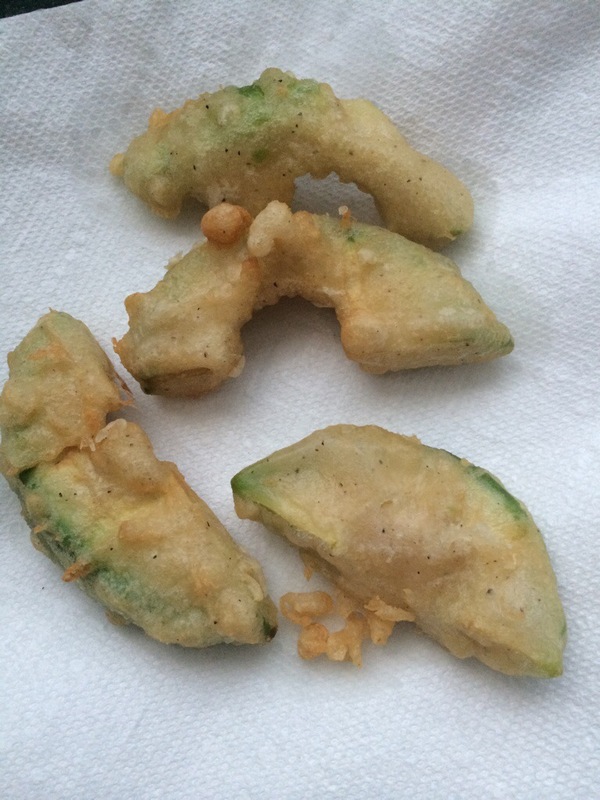 Fried avocado?! I hear the chorus of angels singing too. I looked at a few recipes and landed on this one (with my own changes, of course), inspired by The Beeroness. Check it out here. It’s delicious and naughty, so get ready. 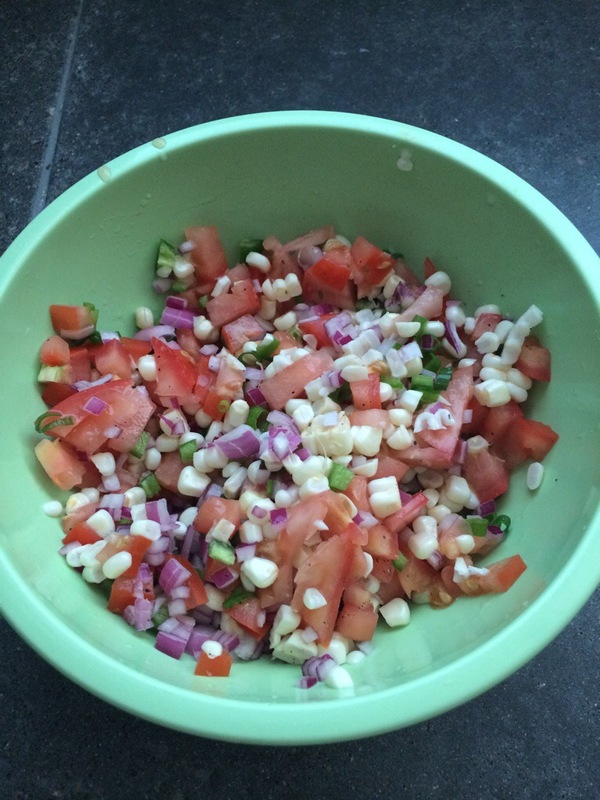 Begin by preparing the corn salsa, so it can chill in the fridge while you do the rest. 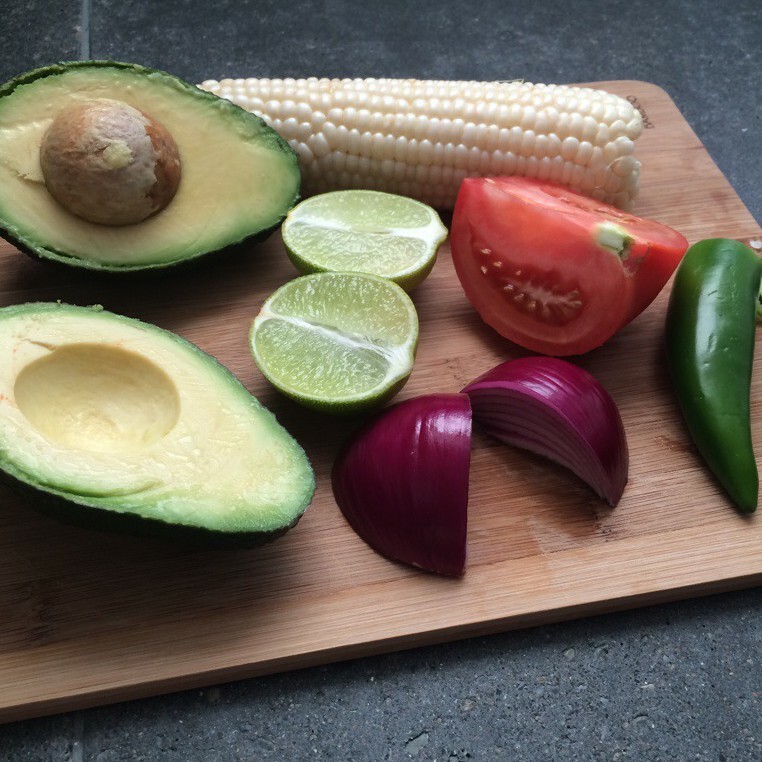 Simply dice the veggies, cut the kernels off the ear of corn, squeeze the lime juice, add a pinch of salt and pepper to taste, and the salsa is done. Once that’s in the fridge, add oil into a medium sized pot, a few inches worth (sorry, didn’t measure). You want enough oil so that the avocados will be covered and so that you can measure the temp without the thermometer touching the bottom of the pot. It will take a bit of time to reach the desire temp, 375 (about 10 minutes). 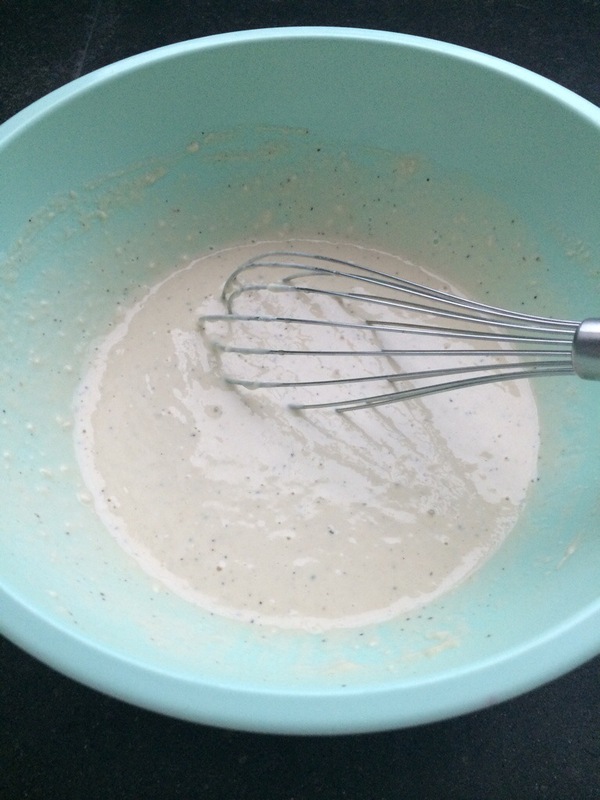 Now, it’s time to prepare the batter. Add all of the dry ingredients into a large bowl and whisk it together. Next, slowly add the beer and whisk together until you have the consistency of pancake batter. 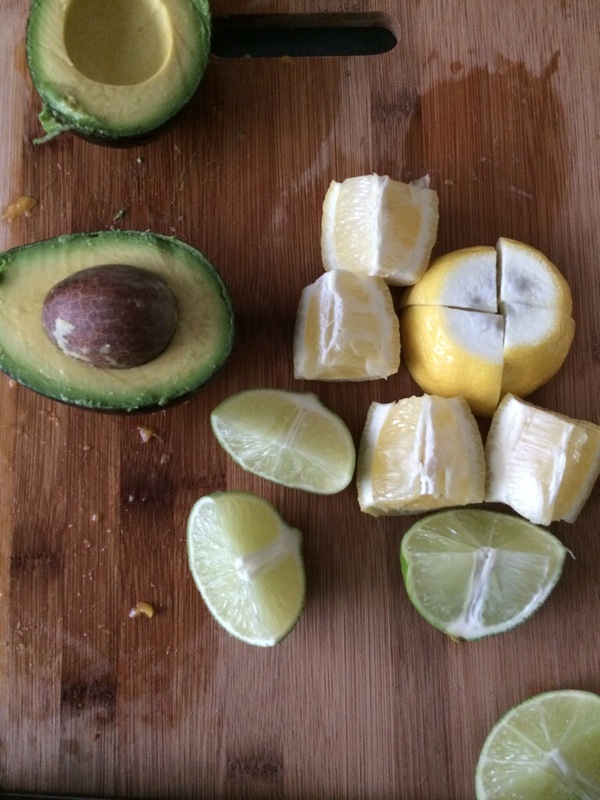 Slice up the avocado and you’ll end up with 8 slices. 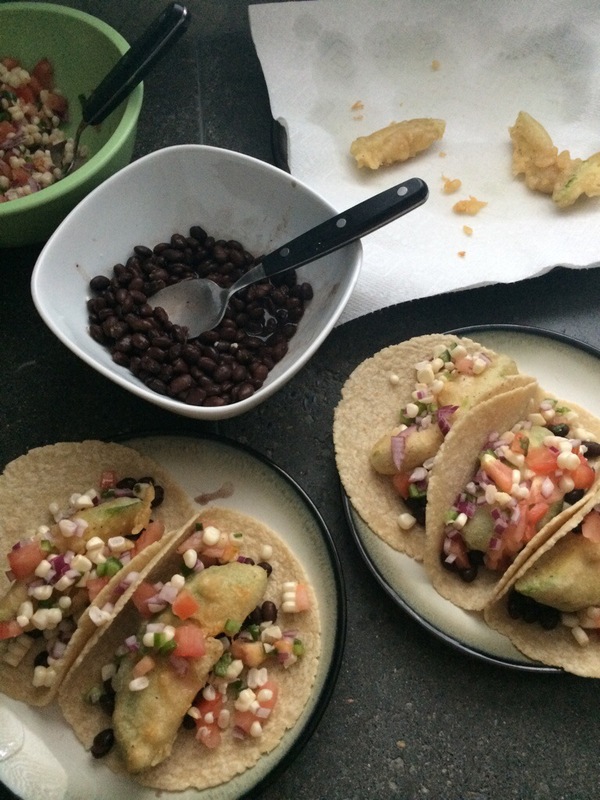 (Each taco will get one large slice, but the smaller slices can be combined for a “beefier” taco.) 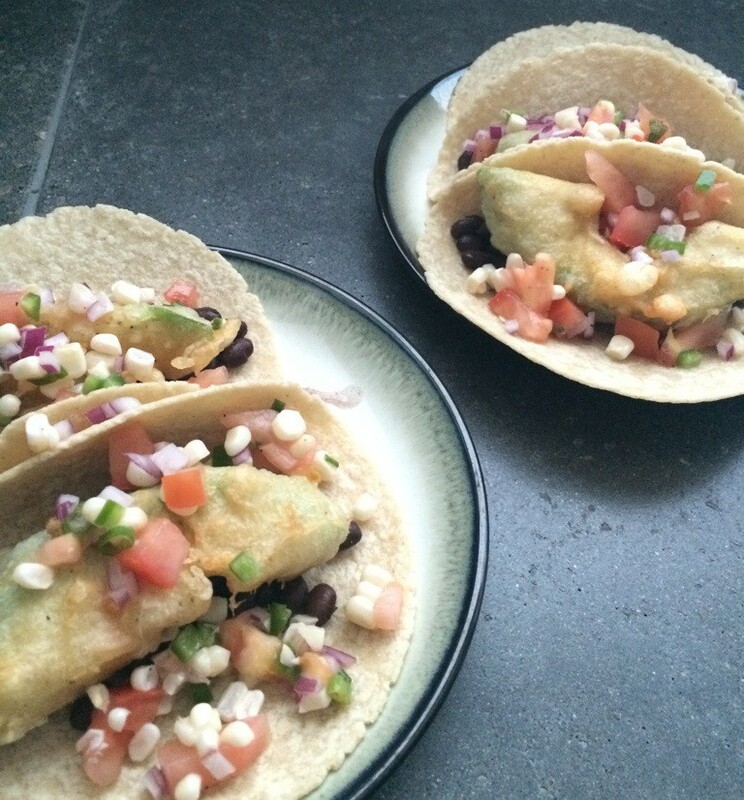 Dunk the avocado slices into the beer batter and make sure that they are getting a really good coating. By now, the oil should have reached 375. Go ahead and pull the first avocado pieces out of the batter and put them into the pot. Everything I read says to only place a couple pieces in at a time so they fry up evenly. I abided by this rule. Each round took only a few minutes, so this will move quickly. Once you put the first couple pieces in the pot, I’d suggest setting up a plate with a couple layers of paper towels. That way you have a place to put the avocados after they are done frying, and the paper towels will soak up the grease. Heat the beans and tortillas. Now, it’s time to assemble! I did about a teaspoon of beans, 1 large avocado piece, and a generous helping of salsa. 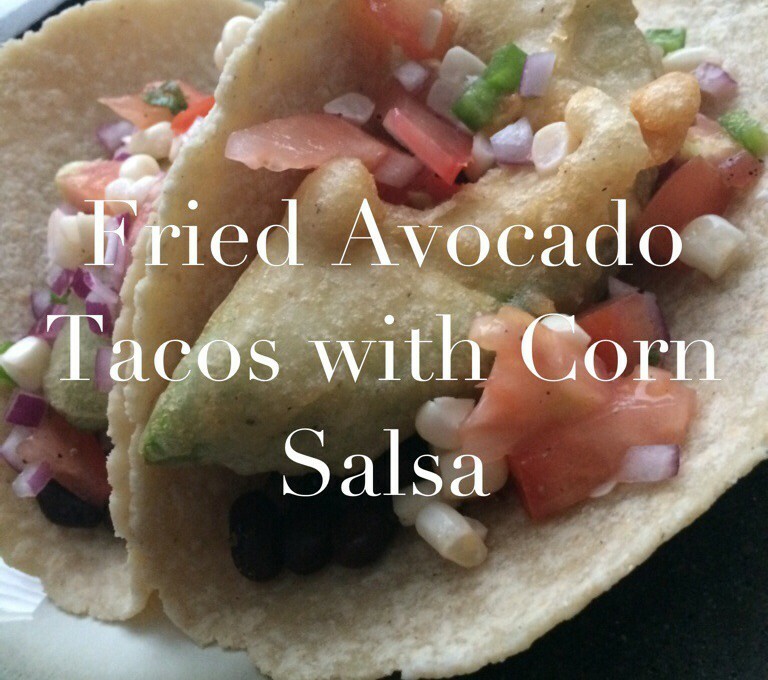 You could add some hot sauce or crema, if you’d like, but I feel like this was the perfect combination of crunch from the beer batter, creamy richness from the avocado, and freshness from the salsa. 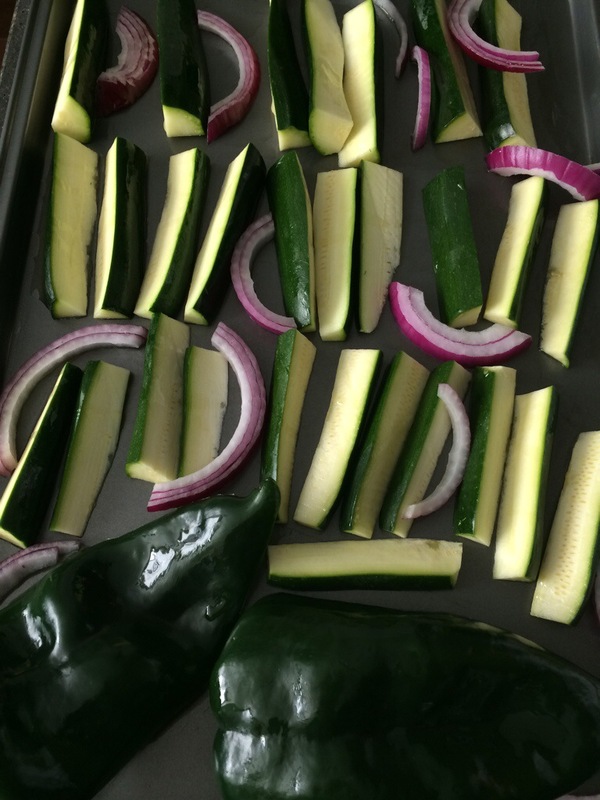 Preheat the oven to 425 degrees, begin slicing the zucchini and red onion, and then place on to a baking sheet. 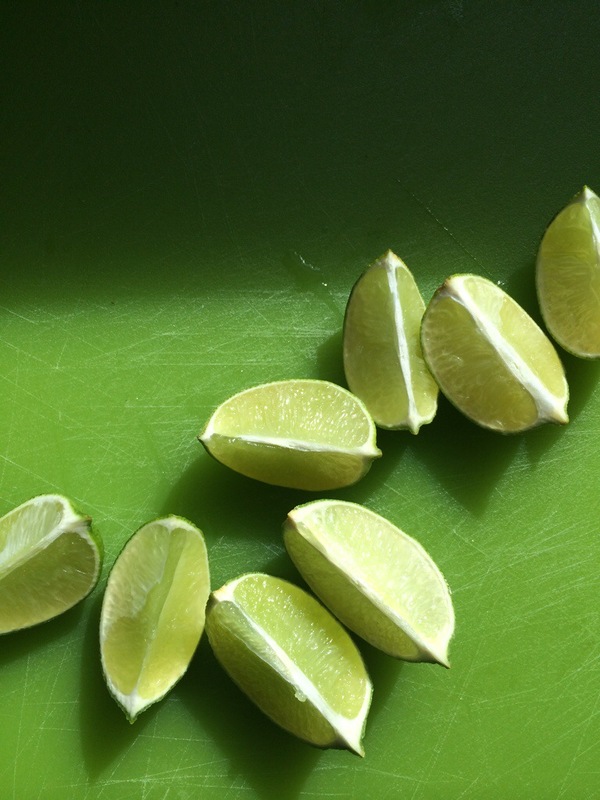 Remove the stem and seeds from the Pasilla and just cut it in half. 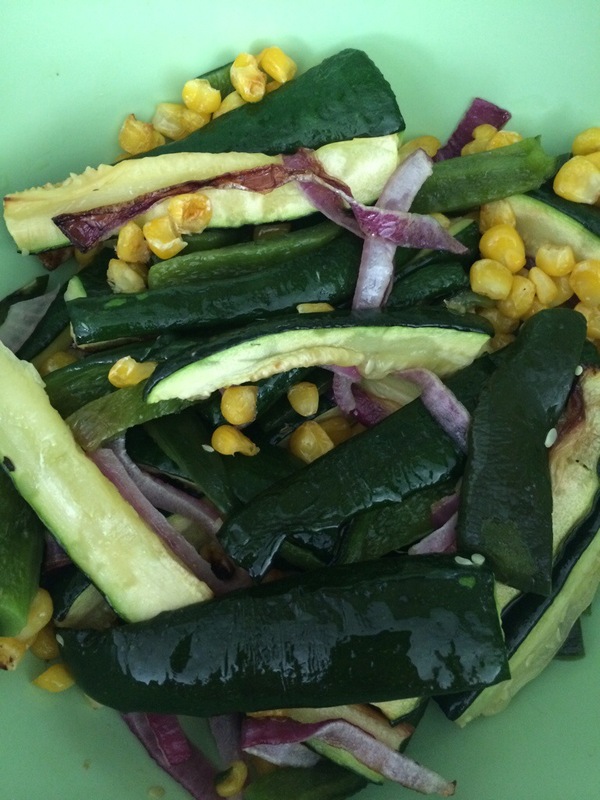 Rub some olive oil on the skin of the pepper, and then drizzle some olive oil over the zucchini and onion as well. It took about 20 minutes to roast the veggies, but I feel like I could have done less time for the zucchini, so just keep an eye on it once they have been in the oven for 15 minutes. While the veggies are roasting, make the creamy chipotle sauce in your food processor. I dumped the entire can of chipotles into the food processor, a decision that I regretted after tasting the sauce, although delicious and smokey, crazy spicy. Consider yourself warned. I’d suggest using half the can, 1/2 cup of crema, and the juice from one lime. If you feel like that isn’t spicy enough, then by all means, go to town and throw the rest of the can in there. This is the point when I realized I had frozen corn and that it would be a lovely addition to the tacos. I simply thawed some corn and browned it a smidge on the stove top. I also realized that I had a can of pinto beans, so you can guess what happened next…I heated the beans on the stove top. Okay, it should be about time to pull the veggies out of the oven. Turn off the oven and put the tortillas on the middle rack of the oven to warm them. Now, go ahead and put the onion and zucchini in a bowl and add the corn too. Let the chiles sit for a bit, until they are cool enough to handle, and pull the skin off, and then slice. Add the chiles to the bowl with a dash of salt, and toss everything together. Pull the tortillas out and put them into a tortilla warmer, or in a towel to keep them warm. Everything is ready, so it’s time assemble and eat. 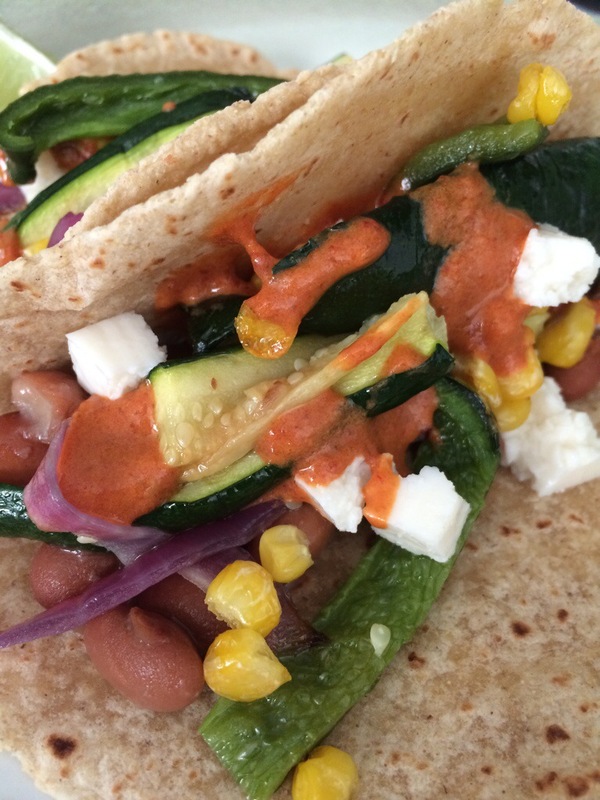 I did a layer of beans, layer of veggies, creamy chipotle sauce, and then some cotija. Garnish the plate with a lime wedge or two and enjoy. As you all know, I like to plan. It makes my life easier when I have control over a few things because let’s face it, you can’t control everything. On Sundays, I enjoy going through my pantry, fridge and freezer to see what I have and think up what I could do with these items. Some days this task is easy, some days it’s hard. Some days the ingredients practically tell me how to use them up, and some days they don’t. When it’s tough, I go to the internet for ideas and inspiration. I like to begin with deciding on dinners first. My goal is to cook at least four times a week. Four is good, five is better, and three is likely. Knowing this helps me from overbuying and wasting food. If you know that you are going to have a busy week and you’ll only cook twice, only buy enough for two dinners. You can always go to the market if you really need something, and then you don’t waste food and money. 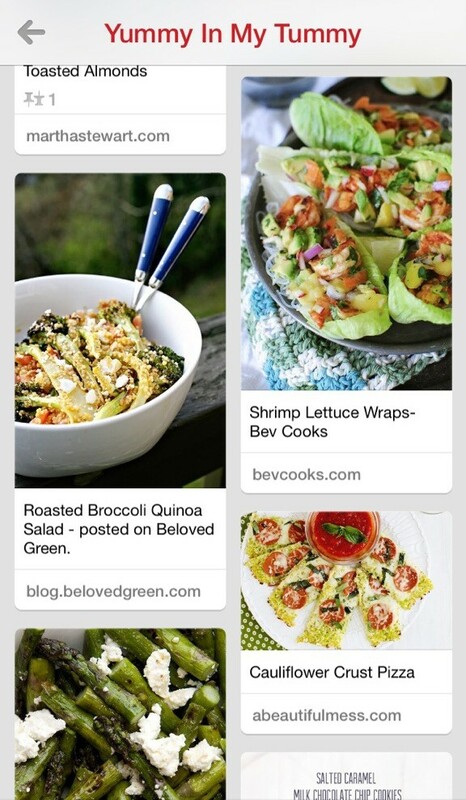 After taking stock and visiting my Pinterest board, I know what I’m making for dinners and can create my grocery list. *Side note, in looking at your menu for the week, think about how these things will translate for lunches. For example, re-heating tacos don’t really work for lunch in your typical office kitchen, so I make sure to buy enough lettuce to create a taco salad for the next day. Once dinners and lunches are covered, I think about breakfast. For me breakfast consists of a smoothie, coffee, and an egg. For my husband, oatmeal and orange juice. Add those items to your list. Now is the time to jot down any other necessities, such as toiletries or cleaning products. There it is, your list, in all its glory. This is the part where I go to my coupon envelopes to see if I have anything that will save us a few bucks. Sometimes I do, sometimes I don’t. The thing I have learned about couponing is that it can be easy to clip coupons because they sound good, but if the coupon is for something you don’t normally buy, it’s not worth it. I clip coupons once a week and stash them in an envelope. 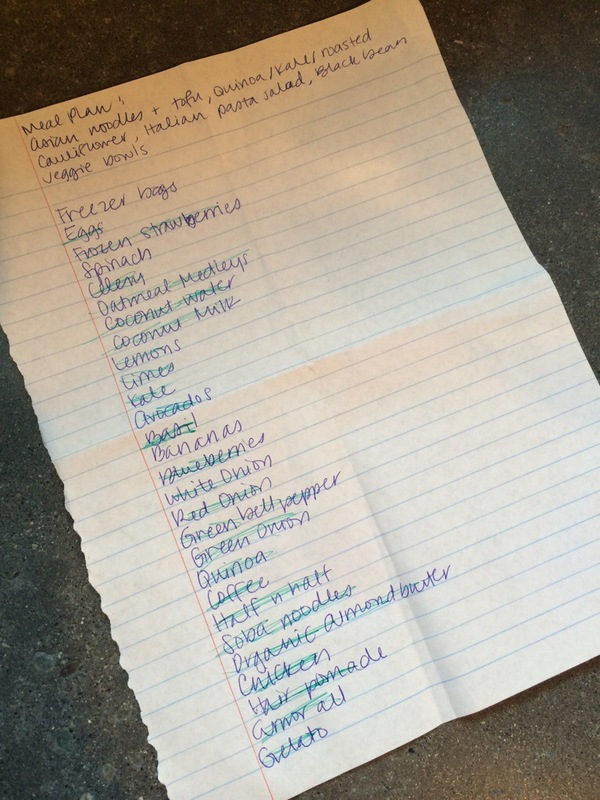 After I make my list, I see what I can use for this shopping trip, and I go through and toss anything that has expired. 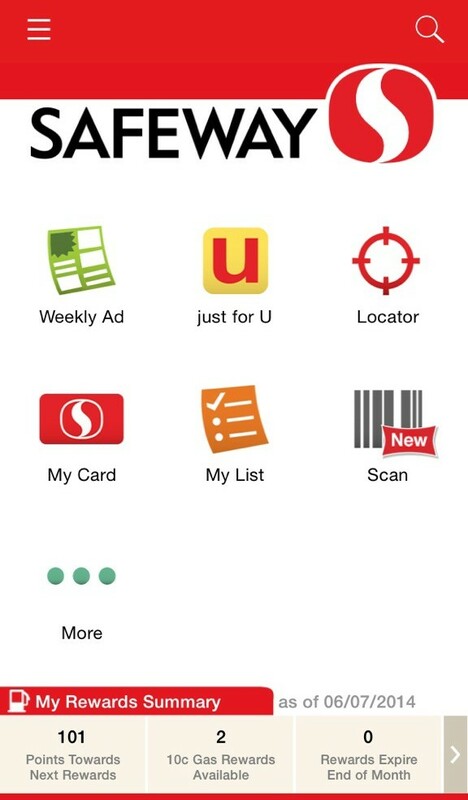 Another way that I coupon is through Safeway’s Just For You program. Safeway is the closest grocery store to me, and convenience is king when it comes to chores like grocery shopping. I simply log into my account, and review all of the personalized deals, store specials, and manufacturer coupons. I click away on what I need, and it automatically loads them to my card. It is super easy, and it’s pretty silly not to do it. Super dorky fact, I have the app on my phone too (see image above). Oh, and I accumulate gas rewards points. After grocery shopping today, I received a $0.90/gallon discount. I know, super dorky. I like saving money, can’t help it. In all this process takes me about an hour. Within this hour, I am able to make my evenings easier, so I have more time to spend with my hubby and pets, and I keep our dinners interesting, so we don’t eat the same things over and over. I’m sure that this isn’t for everyone, but it works for me, so I wanted to share. It was a sunny, warm day here, so I decided to do everything in my power to not use the oven or stove. 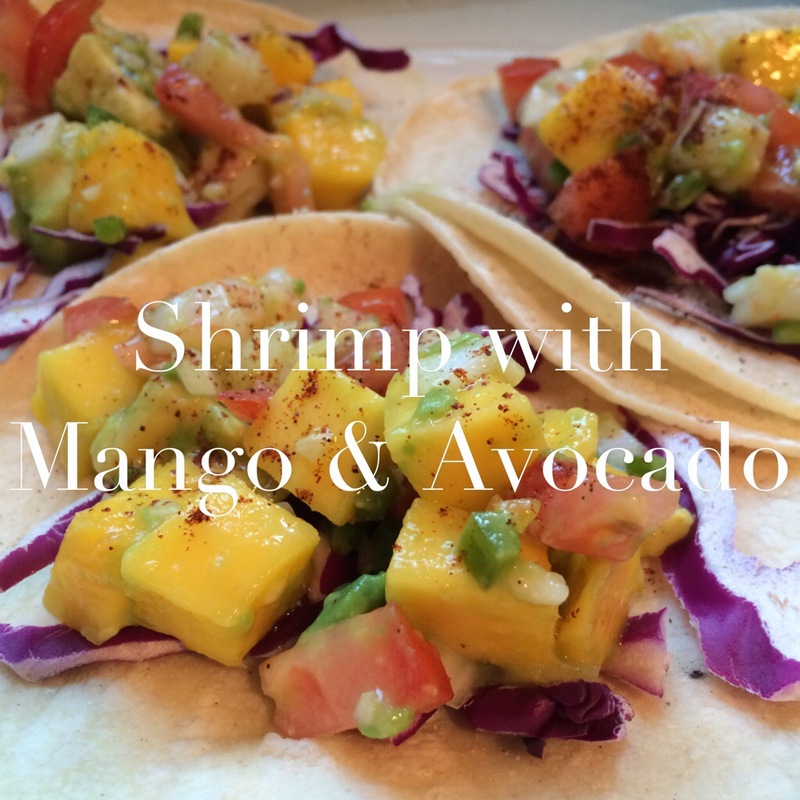 Enter shrimp with mango & avocado tacos. Mission accomplished. I wanted to make ceviche tacos but I didn’t have raw shrimp, and I ended up working late, so I didn’t really have the time either. This is my “short on time” version. 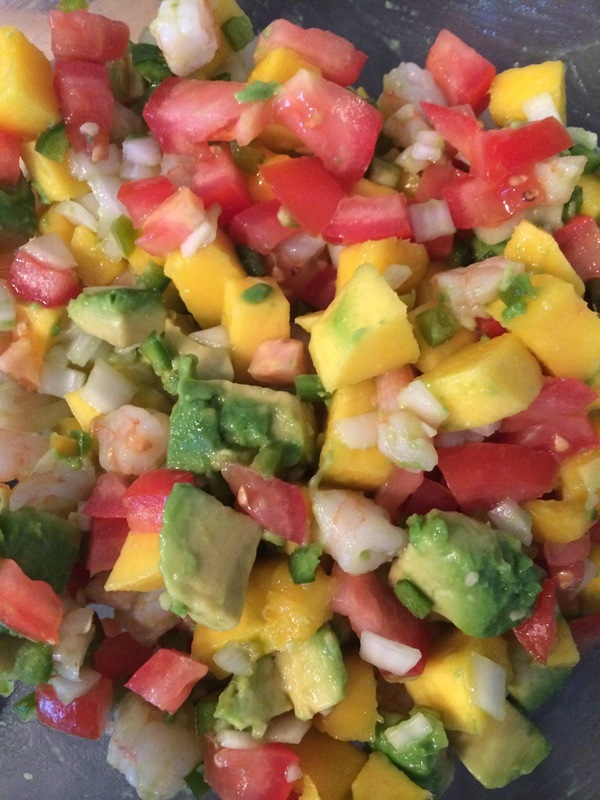 I had cooked shrimp and red cabbage in the fridge, and mango, avocado, tomato, onion, lemon and lime in my fruit bowl. I chopped up all of the ingredients, squeezed in the juice of 1 lemon and 1 lime, and added a dash of sea salt. I let it sit in the fridge for about 30 minutes to chill and allow the flavors to come together. To put them together lay down a layer of shredded red cabbage, a couple scoops of the shrimp/mango/avocado mixture, a dash of chili powder, and you’re done. This made 6 tacos with a generous helping of leftovers, which I used to make a salad for my lunch. 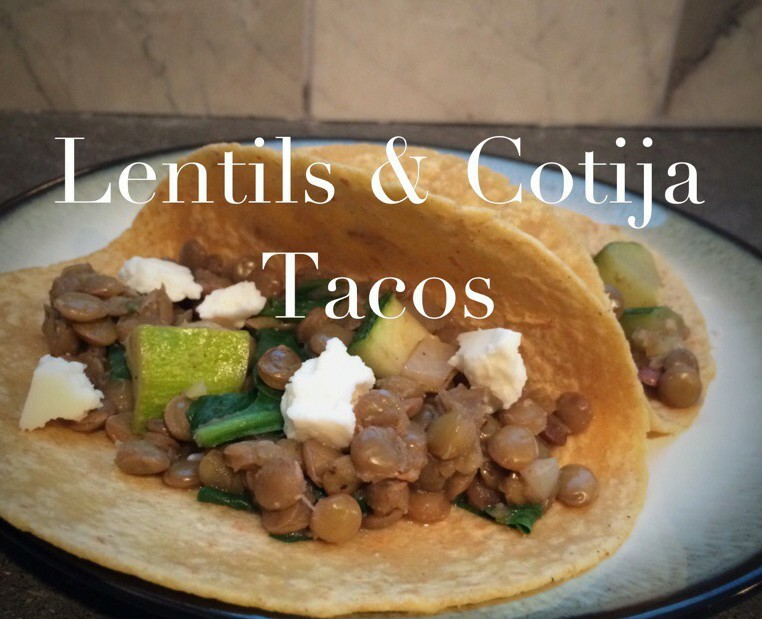 My regrets–not having cilantro and not heating the tortillas on the grill. I think those two things would’ve made these tacos stellar. They were still pretty delicious though. Give them a try and let me know your take on this recipe. Using some leftover potatoes from breakfast over the weekend, and a few gems from the fridge, I created a tasty meal for Taco Tuesday. I had high hopes for this meal, but once I started cooking, the meal got away from me. I forgot to take photos, I overcooked the eggs, and meant to add avocado. I thought about not posting it because it’s not the prettiest meal I have ever plated, BUT it was so yummy, I decided to go ahead and do it. Let me tell you what you’re looking at here. 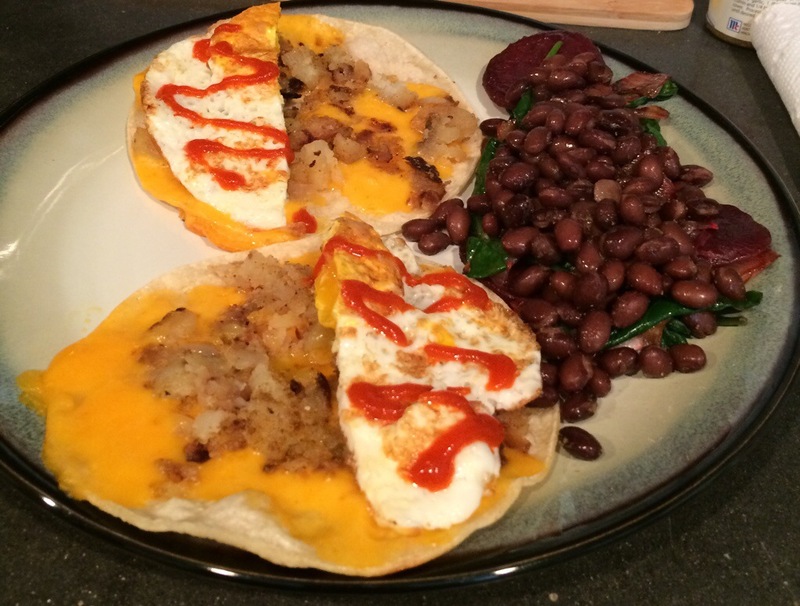 We had corn tortillas with melted extra sharp cheddar cheese, potatoes seasoned with cumin and sea salt, topped with over hard eggs. 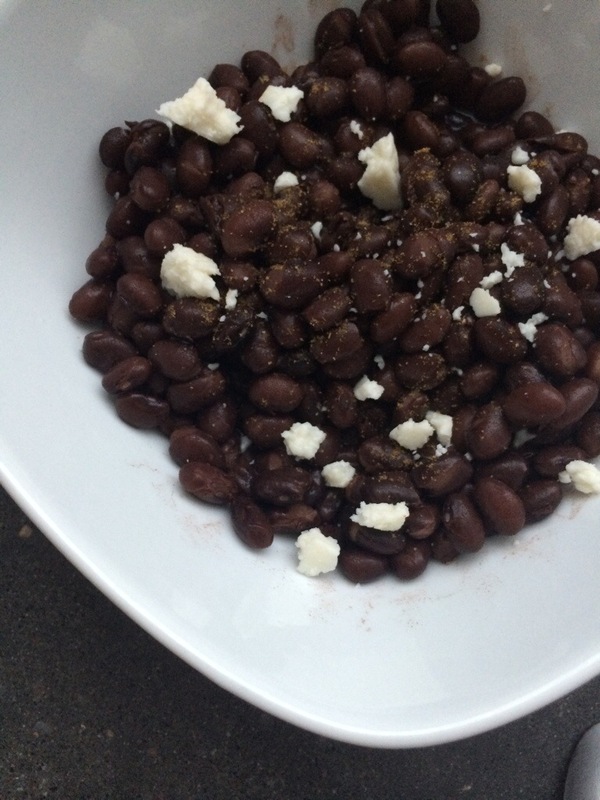 For the side, we had black beans spooned over sautéed onion, spinach and beets seasoned with minced garlic. To eat the tacos, we simply folded the tortilla –with all of its deliciousness inside– in half and ate it like a normal taco. 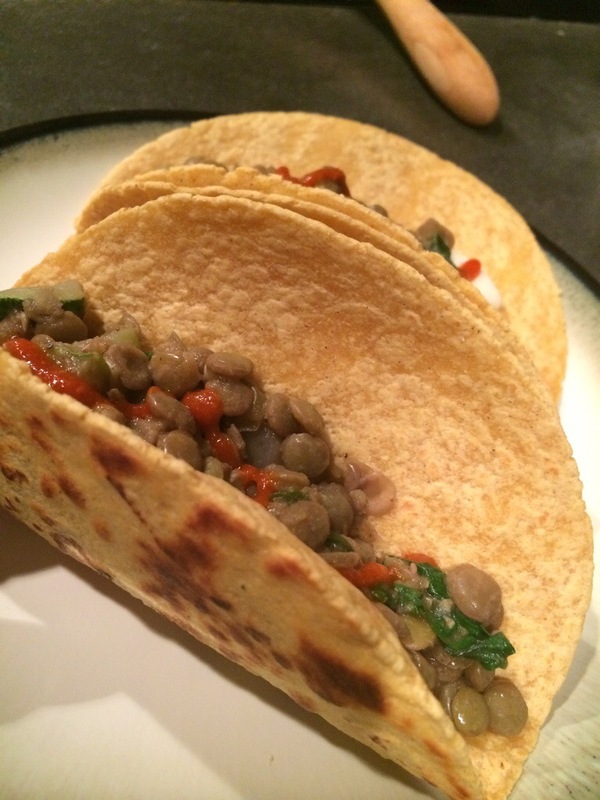 My husband spooned some of the beans and veggies into the taco too…brilliant. Okay, my inspiration…the leftover potatoes. 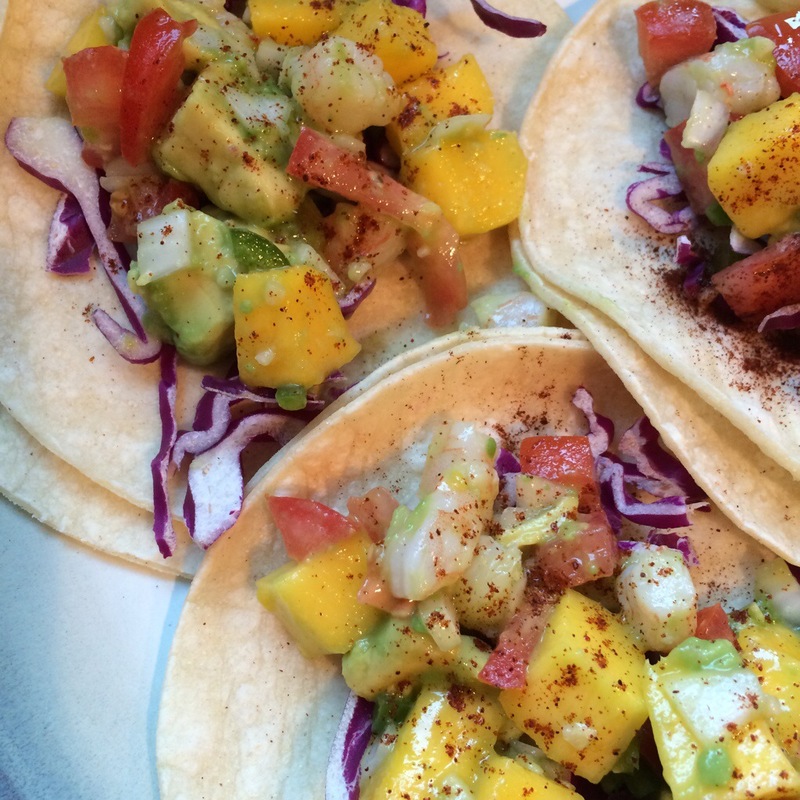 I didn’t want them to go to waste and it was time for a Taco Tuesday post, so there you have it. *I added some olive oil, cumin and sea salt, and then I mashed it to create a little potato patty. I popped it in the oven at 350 for about 15 minutes to crisp it up. *While the potatoes are crisping, prep your veggies and start heating some oil and garlic in a pan over medium heat. Once the onion is translucent and the garlic is fragrant, add the beets and sauté for about 15 minutes. I say, add whatever veggies you have here. You can’t go wrong (says the vegetarian). This is also a good time to heat up your beans on the stovetop and season them up. It shouldn’t take more than 10 minutes to heat leftover beans or canned beans. *Add a little olive oil to a pan over medium heat, put two tortillas in the pan at a time, and then sprinkle on some cheese to get it melted. Now is a good time to make your eggs. Making an over hard egg takes about 5 minutes (cook 2-3 minutes on each side). While the egg is cooking, and the cheese is starting to melt, add some of the potatoes and let it all cook for another couple minutes to allow the cheese and potatoes meld together nicely. Your egg should be ready to flip now. Pull the tortillas off the pan and place them on to a plate where they can stay warm. 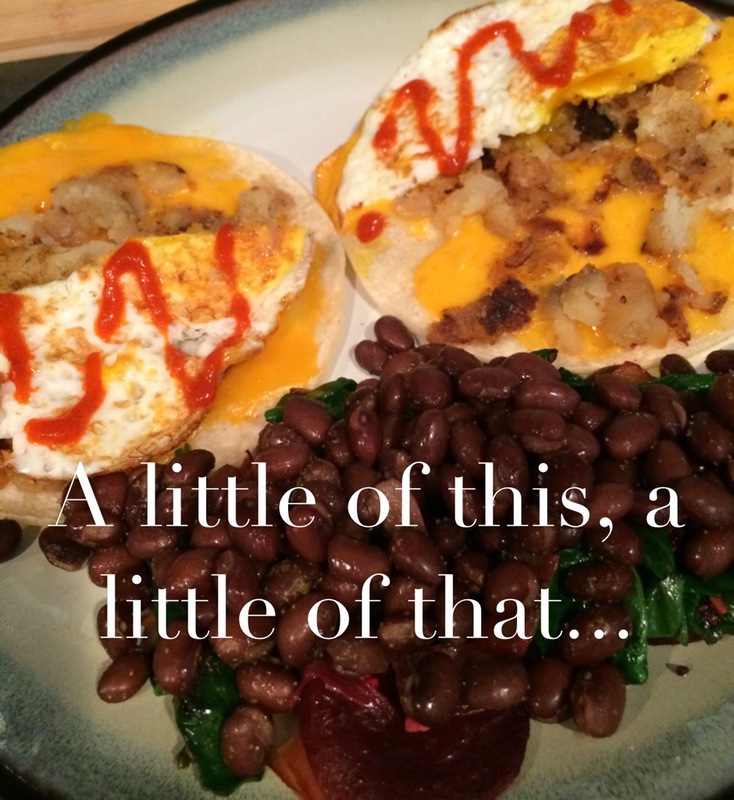 Top the tortilla concoction with half of your over hard egg. *That’s it! 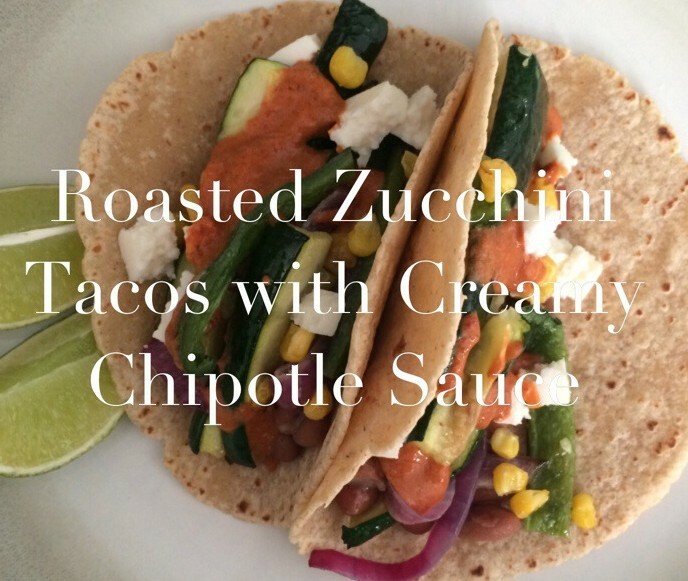 Add some hot sauce to your tacos, serve the veggies and beans. Enjoy!